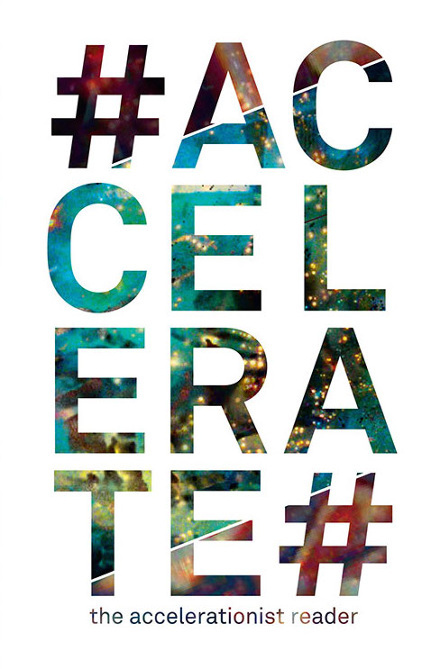 Accelerationism came to prominence in 2013 with Nick Srnicek and Alex Williams’s hashtag-titled manifesto. A cloud computing-era spin on the old Marxist argument that we first need to perfect capitalism in order to transcend it, its lineage is fleshed out in a new book from Urbanomic. Urbanomic claim (among others) Nick Land’s skynet midwifery, J.G. Ballard’s science fictionalization of culture, and Marx himself as precursors to Accelerationism, establishing it as a serious anti-humanistic response to the challenges that humanity faces if it is to avoid extinction. Similar to Christine Harold’s strategy of “intensification“, Accelerationism calls for us to appropriate the value of capital’s developments and transform them materially into something else rather than attempt to resist them head-on or refuse them in our hearts. The Accelerationist Reader (2014) by Alex Williams & Nick Srnicek. Bitcoin is an example of an accelerationist technology. It uses Internet-scale computing resources to rebuild social bonds by destroying the requirement for them in monetary exchange. You don’t have to know me or trust me or any third parties to receive money from me in the form of Bitcoins. You just have to trust the algorithms that very publicly operate the Bitcoin network. The new Ethereum project takes the blockchain technology behind Bitcoin and generalizes to contracts for purposes other than just the transfer of money, although of course those contracts can involve payments. Ethereum contracts exist as a distributed database of small programs and their state that resembles nothing so much as an economic LambdaMOO. There’s a good guide to their promise and potential pitfalls in the talk “Ethereum: Freenet or Skynet ?” by Berkman Center Fellow Primavera Di Filippi. Smart contracts and smart property, which uses smart contracts to identify and control ownership of physical resources, were first described by Nick Szabo in the 1990s. Smart contracts are “smart” because they are implemented as computer code rather than as legal documents. Real world examples include vending machines, in which a contract to purchase goods is encoded into the simple software that dispenses carbonated drinks when you insert the correct money, Boris Bikes, RFID card payments for photocopies, and car hire schemes that unlock vehicles and track their use with QR codes. Would-be rentiers who try to launder their ambitions with the warm fuzziness of “sharing” are salivating at the prospect, as are the incorrigible snake oil merchants of DRM, but that is not what concerns us here. Smart contracts and smart property for art already exist. The artwork “A Tool To Deceive And Slaughter” constantly re-sells itself on eBay. The GIF ownership service “Monegraph” uses the NameCoin system to track notional ownership of instances of infinitely reproducible digital art. These are extensions of pre-digital art contracts such as certificates of authenticity or ownership for conceptual and immaterial artworks. They show a way for art to continue producing a useful critique of property and social relations under technoculture, and for new technology to feed art’s ongoing critique of its own production and nature. I wrote about this in “Artworld Ethereum – Identity, Ownership and Authenticity“, which provides code examples demonstrating how simple it is to implement some of these examples with technology dedicated to smart contracts. 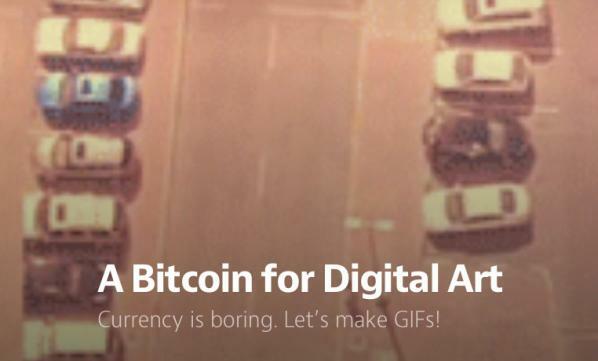 The GIF ownership service by Monegraph”. Like Bitcoin, smart contracts and smart property do not require social trust to build social value, just running code. They have very limited functionality, being unable to check RSS feeds on the Internet for information for example as that information might be tampered with. This raises the question of how individuals can be encouraged to provide valid real-world information to smart contracts rather than just entering the values that will immediately profit them the most. Capitalist economics answers this with the concept of incentives. Value, and values, can be determined by the behaviour of individuals in markets in response to economic incentives. And smart contracts are intended to make markets more efficient. I would like to apply this agoric approach to truth to the crisis of art criticism in the face of aggregation that I identified in “The Proletarianization Of Art Criticism“. Individuals can be motivated to publish defensible aesthetic and art critical opinion in novel ways via smart contracts. I am not proposing an automated or purely algorithmic art criticism here: human activity is the core of this approach. Nor am I proposing an Amazon Mechanical Turk-style exploitation of affective labour. Rather I am proposing an Accelerationist approach, using the technology of digital capitalism to rebuild the social flows that it has destroyed. Crowdsourcing with smartsheet and Amazon Turk. Art is no stranger to the idea of markets, the artworld consists of one of the least regulated and therefore in theory one of the purest markets. But even ignoring the opacity and corruption of the art market, there is a problem with taking a direct approach to the art market as an arbiter of artistic value. As David Galenson‘s 2008 study of aesthetic value and market price showed there is a problem in using pure market mechanisms to establish the value of art: many “great works” have either never been auctioned or have not been to market in decades or even centuries. I therefore propose three different approaches to art criticism via smart contracts. For work exposed to the market, the mechanisms used to price shares and other financial assets can be used. For work with less exposure, SchellingCoins and prediction markets can work alongside these mechanisms via proxies. The prices of financial assets, stocks and shares or contracts for commodities for example, are set using a system of derivatives. Financial derivatives gained a bad reputation following their role in the global financial crash of 2008. By 2011 the notional value of the derivatives being traded was almost ten times the total GDP of planet Earth. And their automation by algorithmic high frequency trading is being increasingly scrutinized by regulators. There are many different kinds of derivatives: short and long options, futures and exotics for example. But in theory at least their function is simple and beneficial. They enable individuals to profit by expressing whether they think a financial asset is over- or under-priced. This incentivizes them to act on this information. The resulting sharing of information and correction of prices benefits society. Non-physical ownership, sponsorship, crowdfunding, dedications and more exotic value relationships to physical works and, crucially, to works that have not or will not be sold and to unownable digital art can be represented by smart contracts. These can then be treated as the underlying assets of derivatives, also represented as smart contracts, in whole or again crucially in fractional parts or shares. Buying and selling derivatives of shares in digital artworks, and particularly going short or long on them, represents a critical position on their worth. Where the underlying asset does not represent actual ownership of the artwork, we are closer to a prediction market than a financial market. But if the assets themselves attract prestige or value regardless of their proxy status they may become art objects in themselves. Art criticism in such a market is a matter of financial investment and returns. Critics express their opinion of art, artists and artistic trends by buying and selling different kinds of derivatives at different times. If they are shown to be correct over time, the market will reward them. Derivatives are a prime candidate for implementation as smart contracts, there is already a project to create a standard language of (non-aesthetic) derivative smart contracts. Since Ethereum contracts have no direct access to the outside world (or the Web), contracts that require information about the outside world must access it through intermediaries. This means that contracts must trust those intermediaries, and if it is more profitable for them to lie to the contracts that creates a problem. To remove this requirement of trust we can use a system that rewards people for independently supplying information that accurately reflects the true (or most likely) state of the world. A SchellingCoin is an Ethereum contract that allows people to send it messages registering their opinion about (for example) the current temperature in Berlin or exchange rate between dollars and yen. Those that set the majority view are rewarded for doing so, similarly to the operation of a prediction market. But how do they know which value to choose? The game theory concept of a focal point, or Schelling point, is an answer to a question that people who cannot communicate will give independently because it seems natural, appropriate or special. SchellingCoins reward people who give the consensus answer to a question, and people can determine the right answer by converging on a Schelling point. For real world phenomena, such as temperature or exchange rates, the Schelling point is likely to be the correct answer. SchellingCoins can be implemented as smart contracts, removing the need for a trusted entity to run them. Schellingcoins are designed to address external, quantitative phenomena. Opinions regarding cultural works are personal and qualitative, and spontaneous reactions to cultural works are even more so. This is different from the commonly expressed quantitative values that the SchellingCoin proposal requires. To adapt SchellingCoins to cultural criticism we must adopt the methods of collective intelligence and the digital humanities and use some tricks to turn personal opinion into cultural appraisal. Collective intelligence algorithms work well with star rating systems and tags. These are popular methods for rating books, films and music on ecommerce and review sites. They can be represeented, aggregated and extrapolated from easily by software, which makes them ideal for representing opinion in SchellingCoins. There are risks in using such systems, as the low rating of the film “Gunday” on IMDB shows, but they are easy and accessible to use. Digital Humanities approaches often involve counting the frequency of words in texts or other unstructured phenomena. The results of binary checks or of counts can be applied to Schelling coins. For example, whether an artwork appears on CAD or Rhizome or not, or whether the words “blue” or “postbinary” appear the most in reviews about it on major review sites can be reported via further SchellingCoins or via trusted feeds or oracles. To turn these approaches into a SchellingCoin, we do not ask what people think of an artwork. We ask them what they think the average reviewer will think of the artwork (or to protect against gaming, we ask them to predict the curve for all the star ratings for the work). Given the theory of focal points, the most likely answer is the one that people suspect will be true. Cultural SchellingCoins can therefore function as aggregators of opinion-about-opinion-about artworks, producing qualitative but consensual evaluations and critiques of works of art that contain more information than purely price-based mechanisms. Using SchellingCoins to aggregate opinion about other schellingcoins, Meta-SchellingCoings, can provide more general cultural critique. To turn reviews into art criticism with a longer or broader perspective we can ask people not what the current state of reviews of the artwork but about what they will be in a year’s time, five years’ time, etc. How highly starred will they be and what tags/words will be used to describe them? Will the work (or the artist) be used as a point of comparison in reviews and articles? Will it (or they) still be being exhibited or purchased, and in what kind of galleries? How much will the work sell for, or in the absence of sales how many people will visit it at exhibitions? Will the artist still be working in that style, or how will their work have changed? Each prediction can be represented as a security in a prediction market, and the current price of that security can be interpreted as the probability of that prediction. For example, a prediction market security might reward a hundred Satoshis or ten points if a particular artist has a headline show at Tate Modern. If you think there’s an 80% chance of that happening, you can pay up to 80 Satoshis or 8 points for the security representing that prediction. If you’re right you gain in return for improving the market, if you’re wrong you lose instead. There is evidence that prediction markets are successful, although they have been banned as a form of gambling in the US and the Pentagon’s 2003 attempt at a political prediction market was quickly labelled a “terrorism futures market” by the press and taken offline. There is already a successful cultural predicton market, Hollywood Stock Exchange, where the price of “shares” in actors, directors and movies function as a prediction of their performance at the box office. The art market itself can be considered a kind of hybrid prediction market, but separating out that predictive function into a pure prediction market concentrating on critical evaluation can remove distortions that result from manipulation of the secondary market and solve the problem of representing critically valuable artworks that aren’t part of the art market. It’s also possible, as with Hollywood Stock Exchange’s use of directors and actors as well as movies, to have prediction markets for other artworld entities. Not just artists and galleries, but movements, styles, genres, subject matter, even formal and aesthetic properties such as colours can be represented as securities in a prediction market. Buying and selling them can help set a shared understanding of their potential and impact. Prediction markets can be represented as Distributed Autonomous Organizations (DAOs) on Ethereum’s blockchain, free from central control. DAOs present an opportunity to re-think and re-implement organizations on the blockchain. As well as markets they can be used to manage events, publications, co-operatives and educational or artworld institutions on various organizational models in a public and transparent way. Cultural SchellingCoins, Artistic Prediction Markets and Aesthetic Derivatives are Accelerationist technologies for art criticism. Not necessarily for art criticism of the kind that survives online after being exiled from print media. Rather a functional equivalent to it that recaptures its lost authority in the form of a relationship between individuals and artistic production that exerts a guiding hand on its reception and direction. As they represent an emergent ontology of art and aesthetics manipulating these technologies, whether through technical or social means, is itself art and art criticism. The text of this essay is licenced under the Creative Commons BY-SA 4.0 Licence.